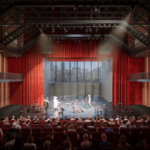 Early this year, the University of Illinois at Chicago (UIC) announced a three-firm shortlist to design a new “Center for the Arts” for the College of Architecture, Design and the Arts (CADA). 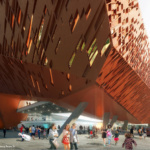 Chosen from an international pool of 36 teams that responded to a request for qualifications, the shortlist includes OMA (New York) with KOO Architects (Chicago), Johnston Marklee (Los Angeles) with UrbanWorks Architects (Chicago), and Morphosis Architects (Culver City) with STL Architects (Chicago). 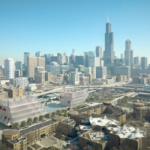 UIC is both the largest university and the only public research university in the Chicago area with a student body among the five most diverse in the country, 40 percent of whom are first-generation college students. 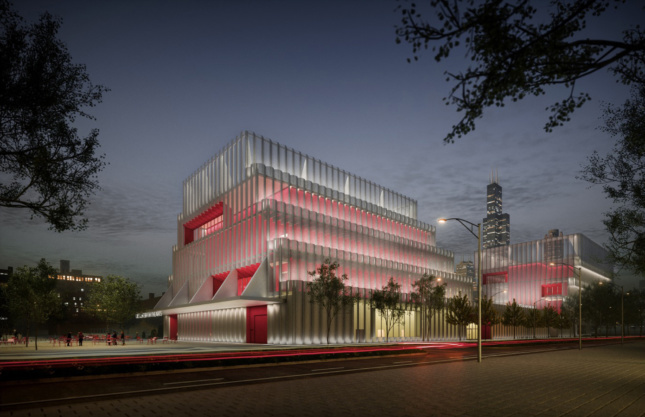 Initiated in 2017, the new Center for the Arts is part of UIC’s 10-year master plan, which calls for major physical development of the campus. 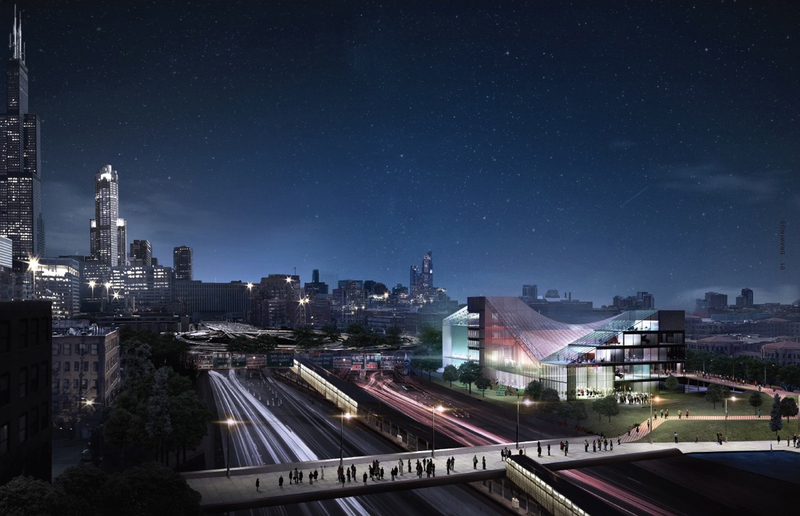 The Center for the Arts will be the new public face of UIC’s East Campus. 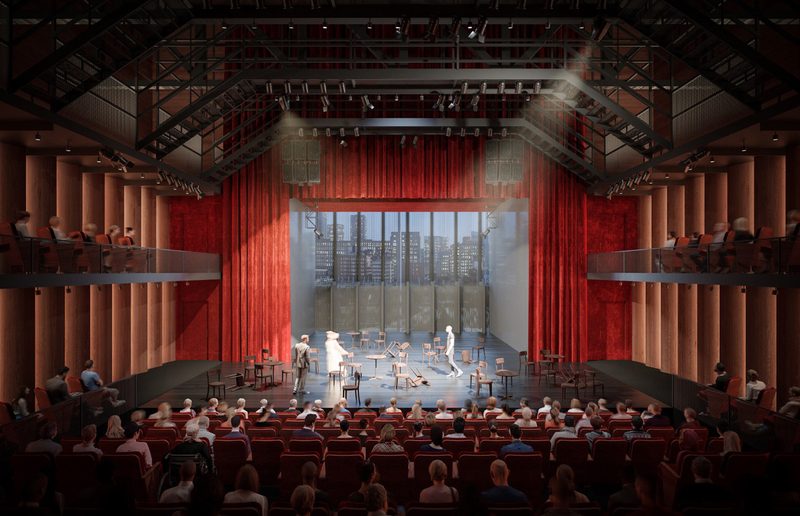 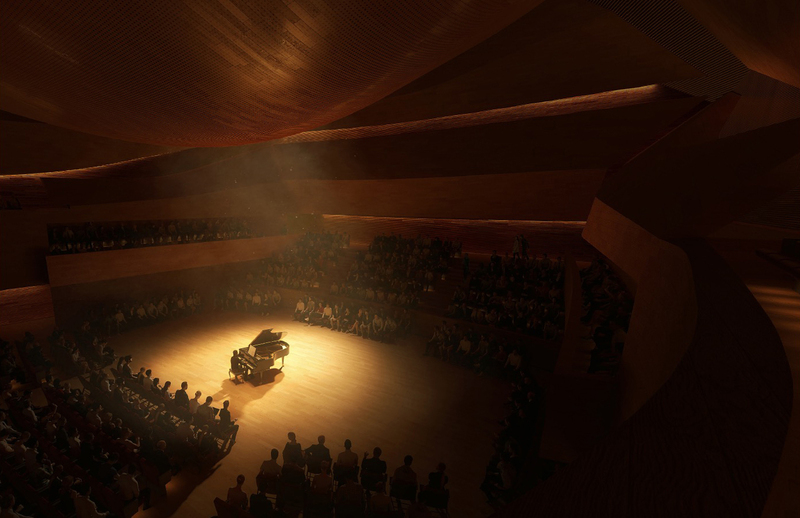 The project aims to provide “radically accessible spaces for all users.” At approximately 88,000 square feet it will be the new home of the School of Theatre and Music (STM) with two primary performance spaces, including a vineyard style concert hall for 500 people and a flexible main stage theater for 270 people. 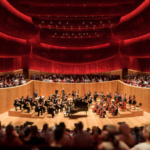 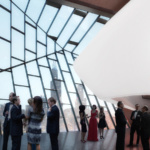 Additional program includes a large lobby, box office, donor lounge, shop, and café. 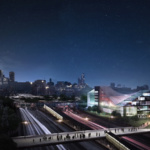 Morphosis and STL Architects have proposed a project shaped by site conditions. 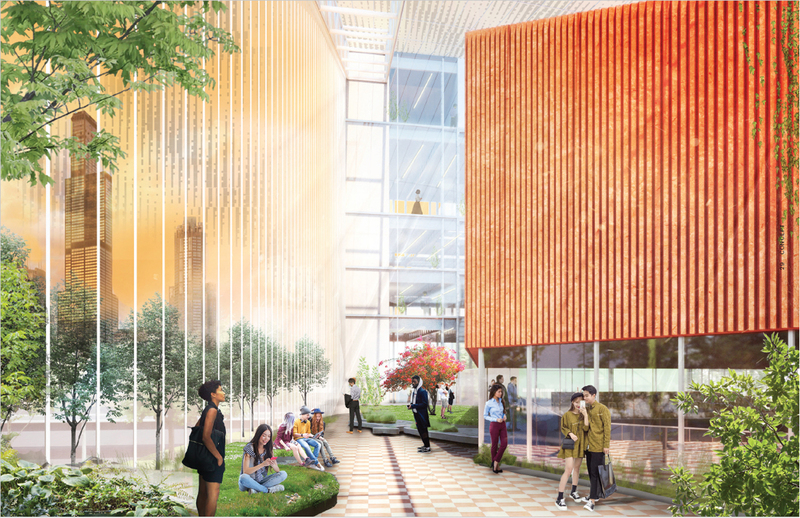 Cues from the site inform the form of the building’s facets made of terra-cotta, concrete, and glass, a signal to the existing materiality of UIC’s campus. 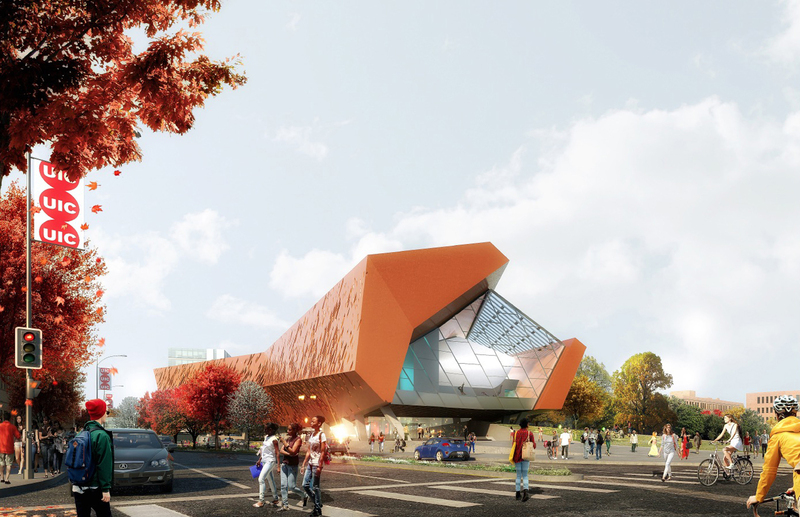 The building has a clear front and back as service entries sit tightly along the highway at the north edge of the site, leaving the south and corner edges to reveal the belly of the building and main points of public entry. 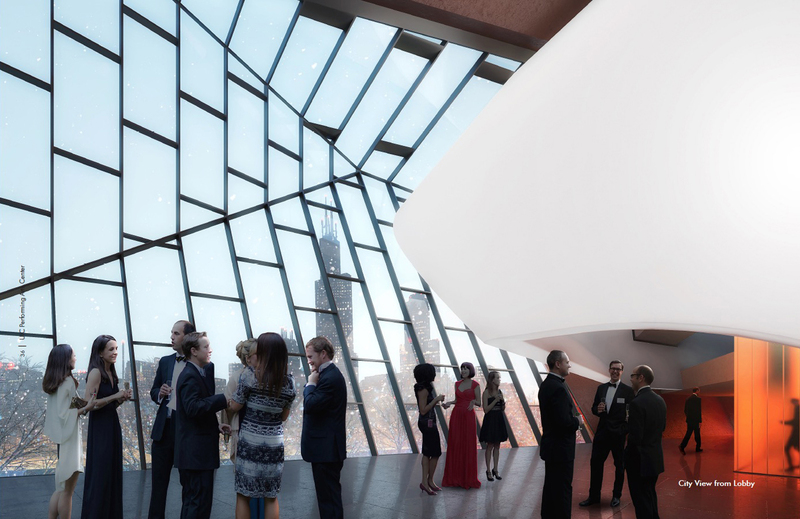 A generous drop-off zone leads into the interior lobby featuring Netsch-like cascading stairs with views toward the nearby West Loop neighborhood and downtown. 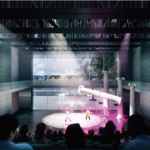 In the theater, a continuous surface ramp runs the perimeter of the room to provide radical accessibility to students learning stage technology. 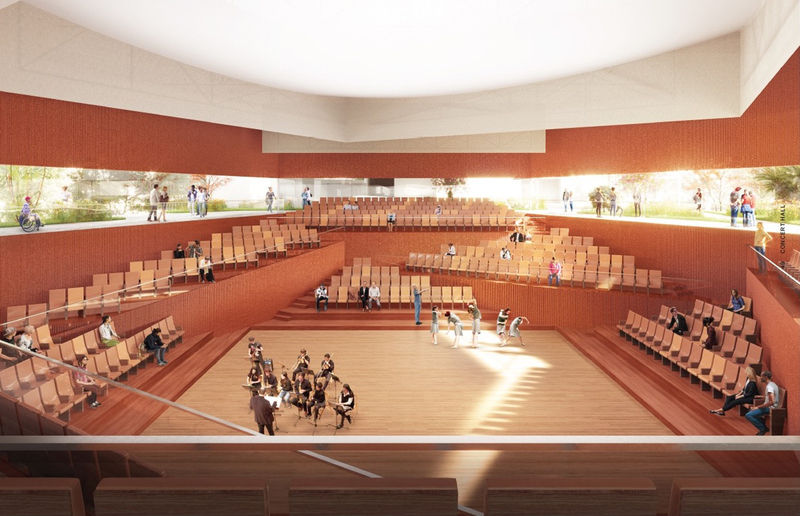 OMA and KOO Architects have proposed a stackable program with a central concert hall flanked by two towers (one for students, one for the public) with neighboring performance spaces. 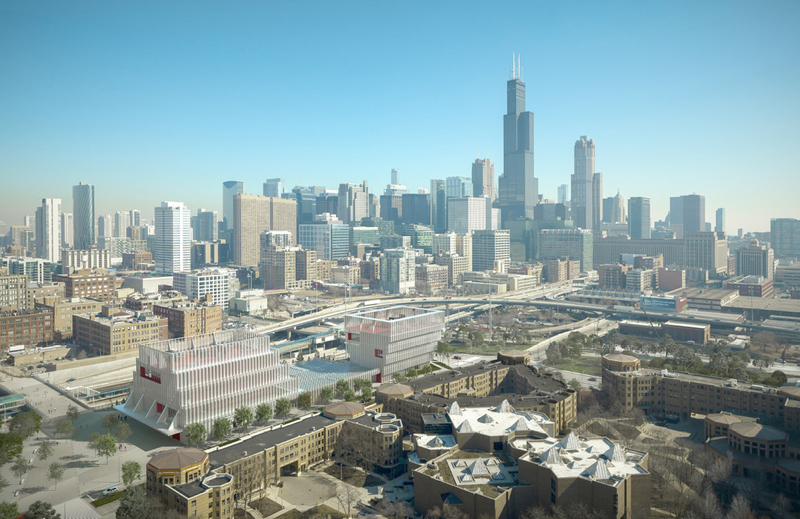 The towers imitate the many Chicago bridges that link the city while the performance spaces act like bookends to anchor the project. 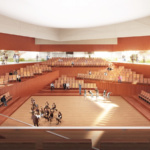 A second-floor plinth accommodates dual entries, each with a continuous surface monumental ramp considered “radically accessible” with physical openness and flexibility. 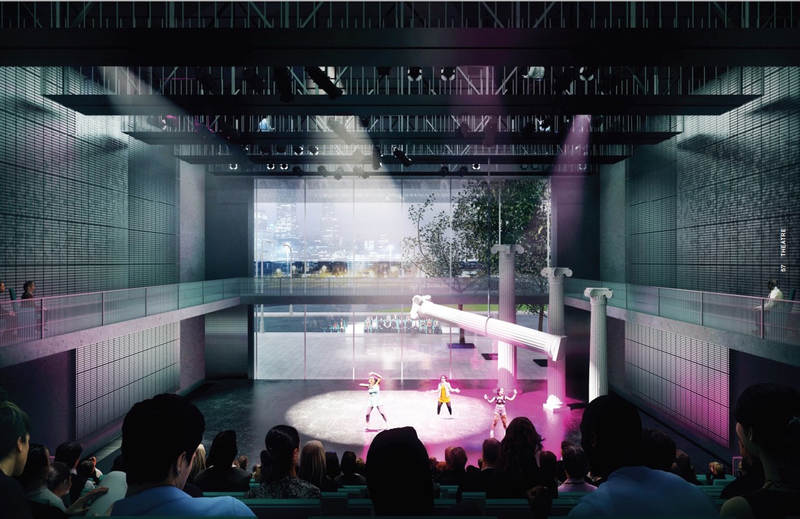 The theater has a rooftop terrace and a large mechanical facade that opens onto the existing Harrison Field, bringing performances outside with the city as a backdrop. 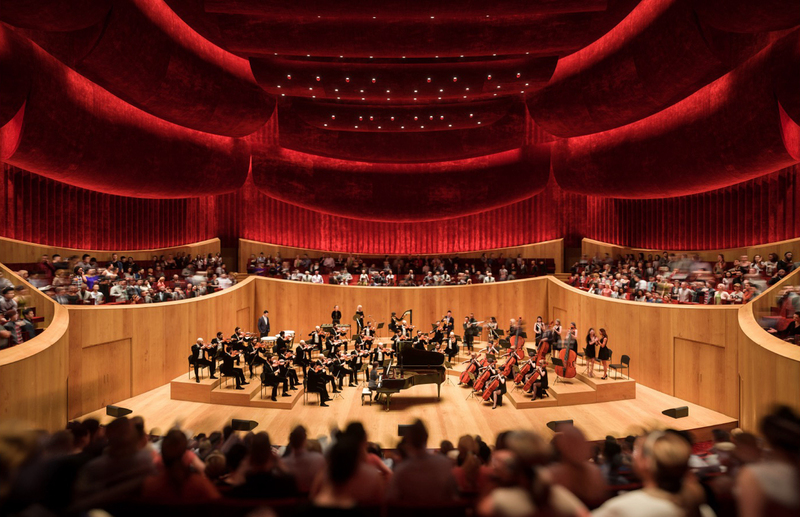 The entire design is blanketed by a doubly-curved, semi-translucent roof that resembles the swinging of a conductor’s baton. 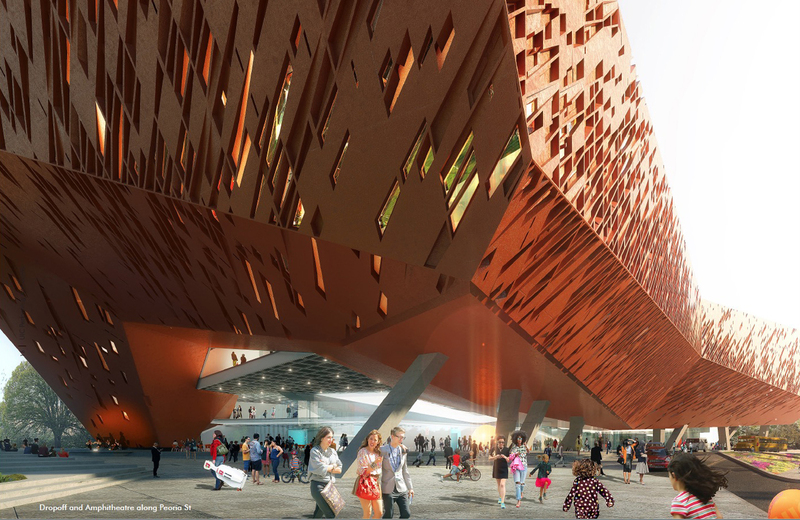 Johnston Marklee and UrbanWorks have proposed two ziggurat-shaped buildings, which Mark Lee of Johnston Marklee described as both archaic and modern. Framed by a greenbelt that reflects attention back towards the campus, two brightly-colored volumes are housed within a glass and perforated metal veil. 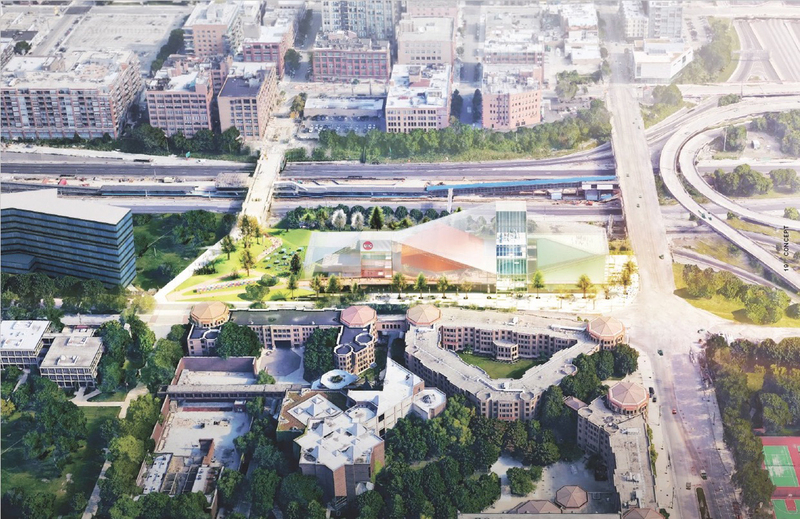 The formal strategy is a nod to Chicago architect Walter Netsch’s ideas of “stacking” while the material aims to visually open the campus, ostensibly creating a new approach to density. 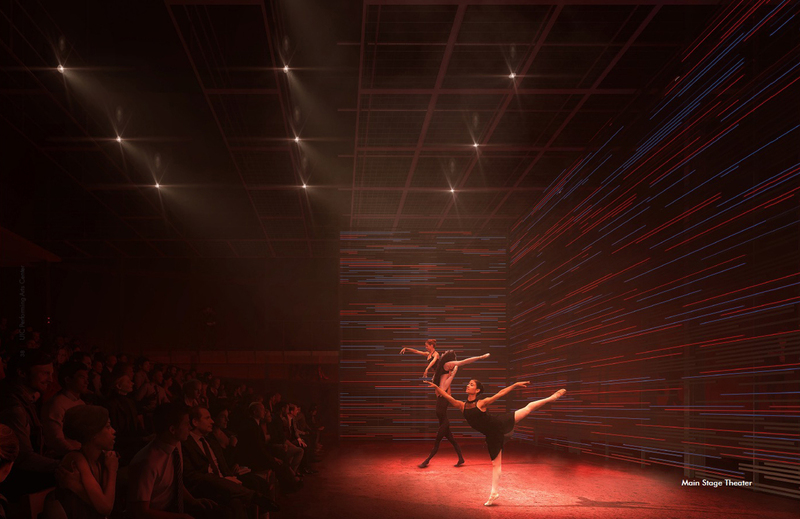 Connecting the two large volumes is a central core featuring an airy winter garden that expands programmatic possibilities for adjacent rehearsal rooms, café, store, and gallery. 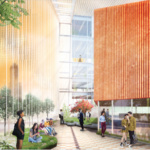 The University and CADA officials are currently in the process of securing the expected $94.5 million construction budget through private and public funds. 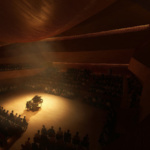 It is unknown when the winner will be announced. 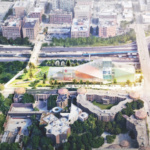 The public may view and provide feedback on the proposals.